This recipe is an easy fix that everyone will love! They’ll never know they’re eating a low carb, gluten free, and healthy chicken nugget. 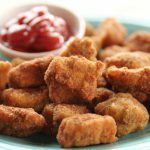 Cut chicken into 1 inch nuggets. Put in large ziplock bag and pour enough pickle juice in the bag so that the chicken is covered. Refrigerate 30 minutes up to overnight. Preheat oven to 425 degrees. Line large baking sheet with parchment paper. In food processor, pulse pork rinds until they are crumb consistency. Transfer to large plate. Add spices to pork rinds and fluff with fork. Remove chicken from fridge and transfer to new ziplock bag. Crack egg into bag and seal. Squish chicken around in the egg so that all of the chicken is coated. Add arrowroot powder and squish around again so that all chicken is coated. Using tongs, work in batches to dredge chicken in pork rind mixture. Evenly coat all of the chicken nuggets, patting them with your fingers to make sure the pork rinds are stuck. Transfer to the baking sheet in a single layer.